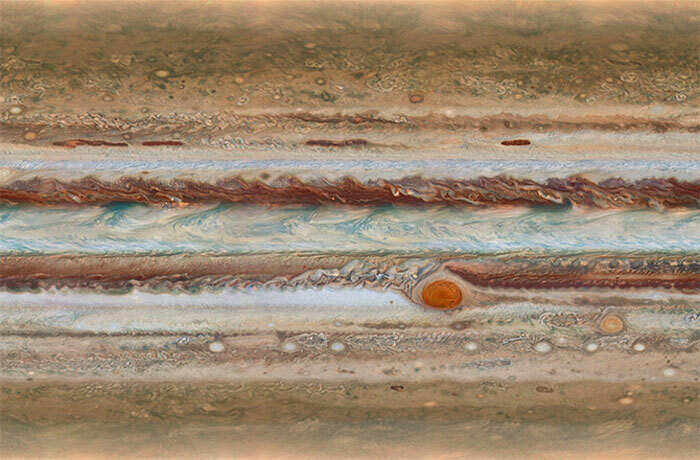 This new image of Jupiter was made during the Outer Planet Atmospheres Legacy (OPAL) program. The images from this program make it possible to determine the speeds of Jupiter’s winds, to identify different phenomena in its atmosphere and to track changes in its most famous features, like its Great Red Spot. Animation of two maps of Jupiter's atmosphere observed by Hubble. One map was imaged on Jan. 19, 2015, from 2:00 UT to 12:30 UT and the second map was imaged on the same day between 15:00 UT to 23:40 UT. The creation of 2 maps allow astronomers to see the motion of gases in Jupiter's complex atmosphere. NASA, ESA, A. SIMON (GSFC), M. WONG (UC BERKELEY), AND G. ORTON (JPL-CALTECH). ANIMATION BY IAN O'NEILL/DISCOVERY NEWS. Another oddity has been spied just north of the planet’s equator — a wave-like structure has formed, something that hasn’t been seen since the Voyager 2 flyby in 1979. During that flyby, these waves were assumed to be a transient event and the fact the spacecraft imaged them was a fluke. But they’ve now returned, no doubt sparking some huge interest as to their origins. Animated detail of the region surrounding Jupiter's Great Red Spot, included the mystery bright filament that appears inside the cyclone.